It provides a magnification of 1.2× for the whole screen, and magnification of 2.5× for the central portion of the screen. The eyepiece can be adjusted to suit most people’s eyesight. The eyepiece tube can be rotated through 360°, and has click stops at 90° intervals. The Eye Coupler is intended to be used between the camera’s eyepiece and the Varimagni Finder for photomicrography using the Focusing Screen 1-12. It is designed to prevent cut-off at the corners of the image in the viewfinder. This combination of high quality angle finder and magnifier permits viewing from above the camera held below the eye, at the knee-high position, or when using the camera on a copy stand. Its eyepiece tube rotates a full 360° allowing you to focus from any position, and a built-in diopter correction ring allows for individual eyesight adjustments. Images reflected on a focusing screen can be changed between 1.2× and 2.5× magnifications with selector lever. This unit is extremely convenient with super telephoto, closeup, and macro lenses. A 90° rotatable lever is built into the eyepiece tube allowing you to select a magnification of 1.2× or 2.5×. To view the whole field through the eyepiece for framing and trimming, set the selection lever at the “1.2×” position. To focus on the subject accurately, turn the lever at the “2.5×” position. This simple lever operation eliminates the necessity of removing the varimagni finder from the camera when framing and focusing, thus avoiding the risk of out-of-focus photographs. To meet the various conditions of interchangeable lenses specially developed for the OM-1 Camera, this unit incorporates a deluxe lens component composed of 9 elements in 7 groups with a reflecting mirror. 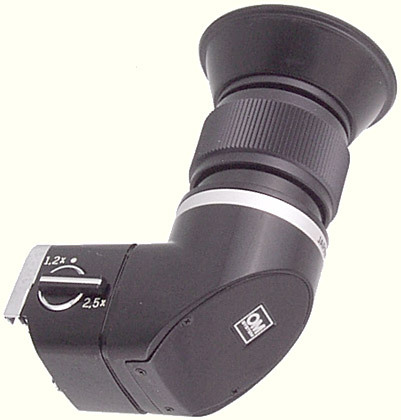 To mount the varimagni finder on the camera, hold the eyepiece tube as shown in photo, right, and slide it onto the eyepiece of the OM-1 viewfinder. Do not use excessive force when mounting or removing it and do not touch the lens surface with your fingers. To correctly adjust the unit to match your eyesight, look through the eyepiece with the magnification lever at “2.5×” and rotate the camera’s focusing ring to throw the subject temporarily out of focus. Rotate the diopter correction ring to the right or to the left, until the microprism on the focusing screen can be seen clearly. Then bring the subject back into focus again by turning the focusing ring. The eyepiece tube can be rotated 360° allowing you to change your viewing position to meet any situation. The tube provides click stops every 90°.